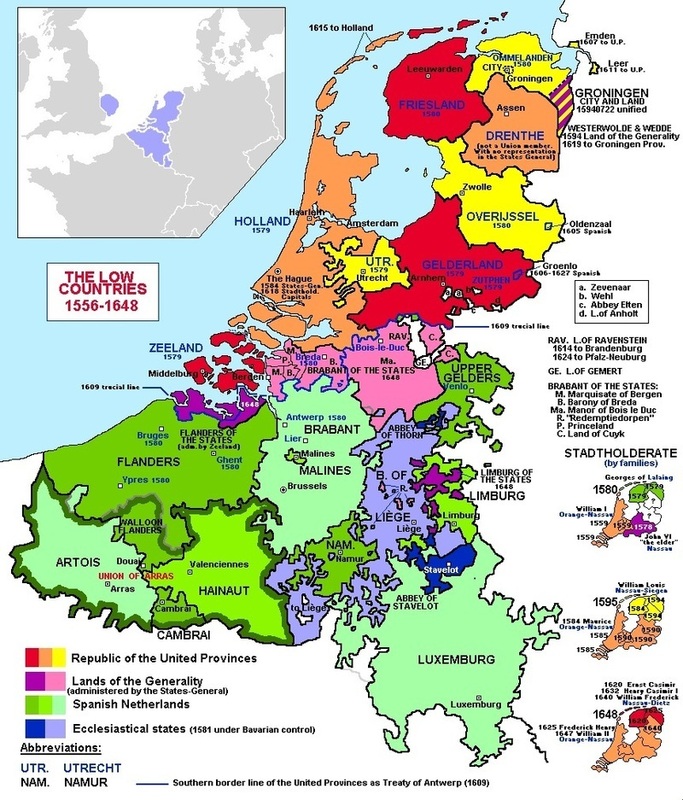 By en:User:Fresheneesz - en:Image:The Low Countries.png, CC BY-SA 3.0, Link with modification to include East Anglia in the mini-map for illustration. Locations of my mother's recorded ancestors in East Anglia. I've posted on this subject a few times before, by looking at the 16th/17th Century Norwich Strangers at Immigration into East Anglia and more recently at some of my families personal DNA ancestral analysis at Are the South East English actually Belgian? However, as I continue to see comparisons between our DNA and DNA from samples of Iron Age / Romano-Britons, Anglo-Saxons, Modern Dutch, Modern Belgian, so my interest in links between the Low Countries, and the region of South East Britain known as East Anglia increases. I have recently been investigating a link on my mother's ancestry. One ancestral line of hers that lived in East Norfolk, carried the surname Tammas. I can only trace it back to a 4th great grandfather, born around 1774. However, I recently became aware that the surname Tammes can be found in the Low Countries, possibly originating in Friesland. More evidence perhaps, of post-medieval migration into East Anglia. 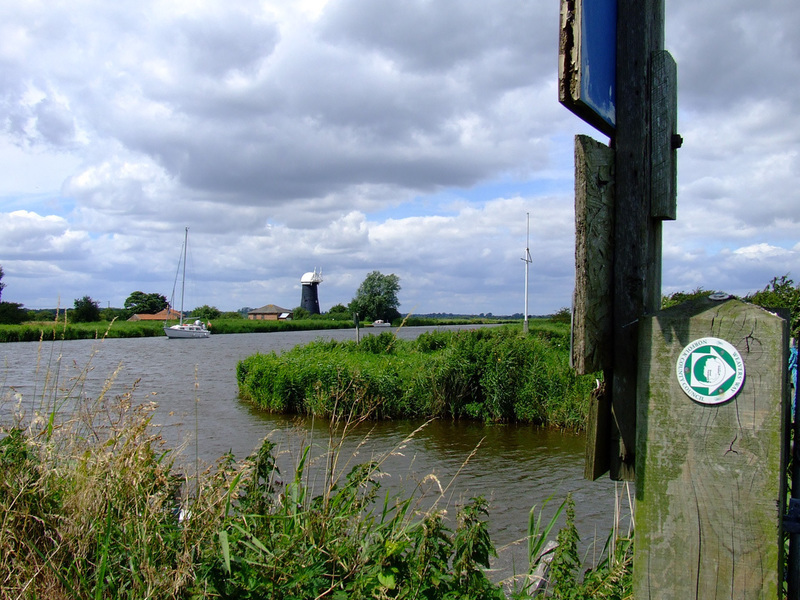 I have other surnames on my mother's eastern Norfolk side, that are also found not only in Norfolk, but also in the Netherlands, France and Northern Germany. For example, Fen, Rosier, Moll, Mollet/Mallett, and Wymer. The Wymer surname is of interest because in 1881, the UK distribution was still very centered on Norfolk. Wymer, Weimer, and other variants are found in Northern Germany, and in the Netherlands, including in Frisia. So there are a few hints of the Low Countries in my recorded genealogy - just there maybe - but do they echo a much older, and wider period? Just how close are the East Anglians to Frisians, Walloons, Flemish, etc? The people that carried the Bell Beaker cultural artifacts into Britain at the close of the Neolithic period, most likely (based on genetic and ceramic evidence) did so by crossing from the Lower Rhine Valley (now the Low Countries) on the Continent, to south eastern Britain. The connection was always there - and most likely, had already existed throughout late prehistory. The fact is that the Low Countries and north east France are very close to us in sea distance. It's a fact often understated in discussions around the origins of British people. Move on to the Iron Age. That metal work and art style, that is so associated with "Celtic" culture, the La Tène, most likely arrived in a similar fashion. It could have shifted along the West of the Irish and British Isles along the Atlantic - but it perhaps more likely, shifted here with trade and exchange - perhaps accompanied by people, from what is now north-east France / Belgium. Towards the close of the Iron Age, Roman historians claimed that parts of south east Britannia had recently experienced an immigration event of Belgic people - from again, the area that we now regard as the Low Countries. Could it be that all they were witnessing, was the result of long term exchange and contact with that region, perhaps with the additional pressure of Roman expansion - both in terms of war, and in trade. The Romans even suggested that in the Belgic homeland, they were some sort of blend between Gallic and Germanic. Rather like the blend of French and Germanic languages in the Low Countries today? Then we arrive with the Anglo-Saxon period. We know that there was a major immigration event from the Continent during the 5th Century / early 6th Century AD. Continental tribes ascribed to the event included not only Angles (from the modern Northern German border with Denmark), but also Frisians and Saxons. Both Frisians and Saxons were also active in the Northern Low Countries. Indeed, Old Frisian is regarded as being the closest known language to Old English - from which English as we know it evolved. Frisian and English belong to the same language group. For a long time, an East Anglian would most likely have been easily able to understand and communicate with a Frisian fisherman, selling fish at Yarmouth. A study based in the Cambridge area, based on the DNA and archaeology of a number of human remains from local cemeteries, including of some remains assessed to be recent Anglo-Saxon immigrants, suggested that the modern English are likely to have had 10% to 40% ancestry from Anglo Saxon immigrants - the remainder appearing to be largely inherited from the people that already lived in Britain previous to the Anglo-Saxon immigration event. They also suggested, that the modern DNA population that most resembled the DNA of their Anglo Saxon remains in Cambridgeshire, were the Dutch and Danish. Does the relationship between East Anglia and the Low Countries end there though? No. Medieval manorial records in eastern Norfolk, report the employment of Flemish immigrants following the 1348 Black Death. During the 1350s - 1370s, there are numerous reports of Flemings being paid (albeit at a lower rate of pay) for harvesting, ploughing, and threshing. There's even a riot in Yarmouth when the locals turned onto the houses of the Flemish workers. Throughout the Later Medieval, there are a number of references to Dutchmen, Frenchmen and other Aliens living, working, or travelling through the East Anglian countryside and market-towns. ‘The Strangers’. Norfolk doesn’t have squares, it has plains. The word is from the Dutch ‘plein’ – a reminder that the language was spoken in the streets of Norwich for many years by ‘Strangers’, the flood of religious refugees and traders who fled persecution by the Spanish duke of Alva in the still-to-be-independent Low Countries in the 1560s and 1570s. Historians still debate the exact impact of the Strangers on the city’s key industry of weaving, but there is no doubting the numbers: by 1582 there were 4,679 of them in the city – more than a third of its population. 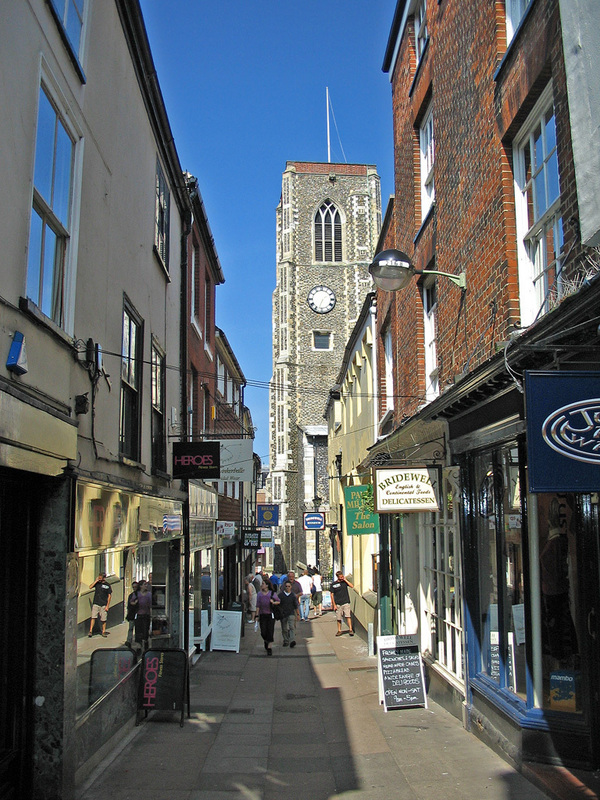 There was still an annual church service in Dutch in their church – the chancel of Blackfriars in Norwich - until 1921. More than a third of the population in Norwich, the urban centre for Norfolk, were Dutch, or French-speaking from the Low Countries! And there were indications that they were also dotted across the East Anglian countryside. The Huguenots were to follow, with a community in Norwich. But aside from these population events - there are mentions in the background. Frisians selling fish at East Anglian sea ports. north east French fishermen frequently sheltering on Norfolk and Suffolk beaches from bad weather. The occasional merchant, and artisan, selling their wares in England. The French and Dutch prisoners of War in the Fens. And was all of this one direction? How many East Anglians (for example, puritans and royalists), ended up sailing to the Spanish Low Countries? Hear a sentence like "immigrants in Eastern England", and many people might think of the recent immigration from countries such as Poland, Lithuania, and Romania. However, I'm interested in the longer picture, and how that has impacted the genetic genealogy of East Anglians. I have noticed, that my mother's 23andMe ancestral composition, is more similar to those of some Dutch testers, than most Irish, Scottish, or West British testers. 23andme has reported at least one small segment shared with a Dutch tester. My mother on Ancestry Composition speculative mode, scored only 36% "British & Irish", followed by 13% "French & German", 4% "Scandinavian", 2% "South European", and 40% unassigned "Broadly NW European". My first reaction was that the 23andme calculators and references were confused by relatively ancient admixture, specifically Early Medieval Immigration between the 5th and 11th centuries AD. The Anglo-Saxon and Viking periods. However, I'm beginning to review how I see the history of East Anglia. I think that like many people, I've underplayed the contribution not only of earlier unrecorded immigration events, but also of ongoing later immigration from the European Continent, into East Anglia. A shock historical suggestion, is that during the late 16th Century, almost a third of the population of the City of Norwich, belonged to an immigrant community of Dutch, Flemish, and Walloon protestants, that had recently settled there, as refugees from persecution on the Continent. I don't know how many of these immigrants, into centres such as Norwich, Ipswich, kings Lynn, and Great Yarmouth, left descendants in East Anglia. My parent's recorded Norfolk ancestry is very rural - outside of Norwich. However, how much DNA did these more recent immigrants leave behind in Norfolk, and East Anglia as a whole? The immigration events of the 5th to 11th centuries AD into East Anglia, were most likely the most significant. However, I believe it is wrong to see them as the only immigration events. The POBI Study found DNA evidence of an earlier, perhaps late prehistoric immigration from the Continent. Caesar claimed that the people that he called the Belgae had recently immigrated to South East Britain, from the area that is now Belgium. Neither were the Anglo-Saxon, Dane-Law, nor Norman immigration events the last to the region. It continued as a background, with occasional known events, such as the Strangers from what is now Belgium and the Netherlands, to Norwich. East Anglia has always had stronger connections to across the North Sea, than some other regions of Britain. Therefore it should be no suprise, that my mother, with her strong recorded East Norfolk ancestry, has an autosomal ancestry composition, that resembles the Dutch, more than the Welsh or Irish. In 1343, a boat capsized at Cantley. It had passengers from Latvia and Sweden. In 1571, a return of the Strangers, recorded that there were 4,013 Strangers in Norwich. This included 868 Dutchmen, and 203 Walloon men. These are just the surnames of some of the Norwich Strangers, mentioned in the above book. Just how much did they, and others, contribute though, to the genealogy of Norfolk and East Anglia. Most belonged to aspiring classes of artisans and merchants. Weavers, printers, hat makers, etc. How much of their DNA might have seeped into the surrounding countryside?